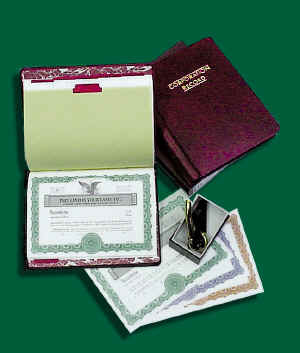 Complete Corporate Kit with Record Book, Imprinted Stock Certificates, Corporate Seal and Slipcase. Includes the seven required organization procedures of Authentication, Subscription List, Articles and Certification of Incorporation, First Meeting of Incorporators, First Meeting of Directors, By Laws and Record of Minutes. The six tab section includes the notes, forms and precedents necessary for use by the lawyer and related staff personnel. 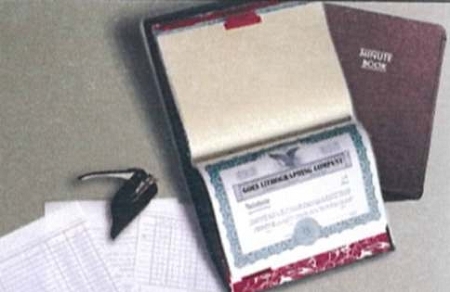 Sixteen high quality stock certificates are imprinted, perforated and numbered for the new corporation with 12 transfer sheets. Papers are green edged for added security. An attractive boxed, black and brass plated embosser is included with purchase.